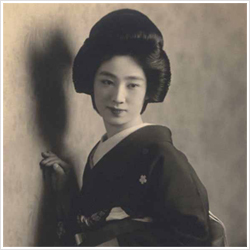 opened on October, 2001, having renovated the house where the renowned geisha and singer ICHIMARU(1906~1997) once lived. The house, built sixty years ago, stands on the bank on the Sumida River and overlooks downtown Tokyo. first opened as an antique shop, selling various antique items, mainly pottery from the Jomon to the Showa Periods. Within a short time, many artists and craftspeople expressed their desire to hold exhibitions in this unique location. As a result, we began renting the gallery on a weekly basis. 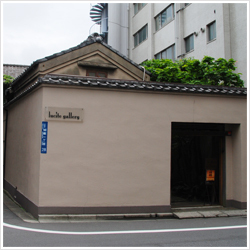 Named after lucite, a transparent acrylic resin developed in the 1930’s, lucite gallery is one of the most desirable gallery spaces in East Tokyo. One aspiration of is to bring back laughter to this old amusement center of Edo. The other is to communicate and exchange ideas through art objects, whether antique or modern. Antique fairs and flea markets are held in April, July (River Festival), October (in Shinjuku ISETAN ), and December (Xmas Fair). Between exhibitions, tea ceremony and lacquer classes are held every month. Please come and join in one of our activities, and also, please feel free to call in English. Copyright © Lucite Gallery All right reserved.